It's long been known that previous exposure to an influenza subtype - say H1N1 - can leave behind (varying levels) of immunity against future exposures. Those born between 1918 and 1957 - during a time when the H1N1 virus was the only influenza subtype in circulation - fared far better during 1977 return of the `Russian (H1N1) flu' than did children and teenagers born after 1957. We saw a similar outcome during the 2009 H1N1 pandemic, with those born before 1957 seeing less illness than others, despite the fact that H1N1 had been in circulation (along side H3N2) since 1977. Today we've research indicating that the first influenza subtype you are exposed to makes the biggest, and most lasting, impression on your immune system. And that the resultant immune response may carry over to other - similar - subtypes. 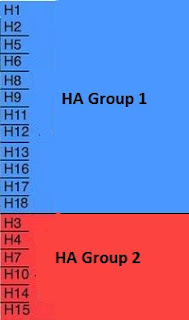 There are 18 known HA (hemagglutinin) subtypes,which are divided into two major HA groups (1 & 2 see chart below). Depending from which group your first exposure came, you may carry some degree of protection against novel flu viruses of that same group. In other words, if your first influenza exposure was to H1N1 or H2N2 (group1), you may carry some degree of immunity to the H5 viruses (H5N1, H5N6, etc.). If, however, your first exposure was to H3N2 (group 2), you may carry some protection against H7N9 instead. And all of this has implications for pandemic planning, prioritization of vaccines (when they are available), and mitigation responses. It also raises some interesting questions on the effect this might have on `universal' vaccines. For those born before 1968, when H3N2 began its reign, their first flu exposure was almost certainly group 1. Those born between 1968 and 1977, group 2. Those born after 1977, could fall into either category. It's a fascinating bit of research, and you'll definitely want to follow the link and read it in its entirety, as I've only barely scratched the surface. The first influenza attack that a child suffers can affect the way that their lifelong immunity to the virus builds up. 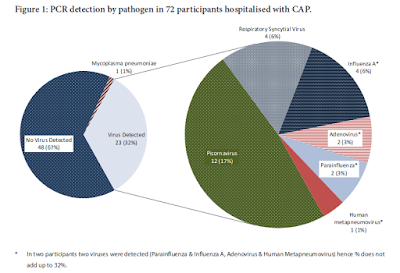 A wide range of influenza A virus subtypes infect humans. 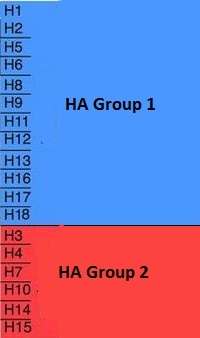 Subtype H5 belongs to HA group 1 (which also includes H1 and H2 subtypes), and subtype H7 belongs to HA group 2 (which also includes the H3 subtype). Gostic et al. found that birth-year cohorts that experienced first infections with seasonal H3 subtype viruses were less susceptible to the potentially fatal avian influenza H7N9 virus (see the Perspective by Viboud and Epstein). Conversely, older individuals who were exposed to H1 or H2 subtype viruses as youngsters were less susceptible to avian H5N1-bearing viruses. A mathematical model of the protective effect of this imprinting could potentially prove useful to predict the age distribution and severity of future pandemics. Two zoonotic influenza A viruses (IAV) of global concern, H5N1 and H7N9, exhibit unexplained differences in age distribution of human cases. Using data from all known human cases of these viruses, we show that an individual’s first IAV infection confers lifelong protection against severe disease from novel hemagglutinin (HA) subtypes in the same phylogenetic group. Statistical modeling shows that protective HA imprinting is the crucial explanatory factor, and it provides 75% protection against severe infection and 80% protection against death for both H5N1 and H7N9. Our results enable us to predict age distributions of severe disease for future pandemics and demonstrate that a novel strain’s pandemic potential increases yearly when a group-mismatched HA subtype dominates seasonal influenza circulation. These findings open new frontiers for rational pandemic risk assessment.